More than a million Flushmate pressure-assisted toilet flushing systems have been recalled because they can burst powerfully enough to cause the toilet to shatter, causing injuries and property damage. 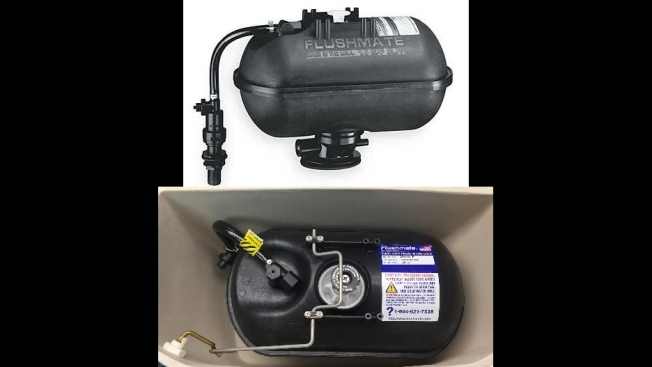 Nearly 1,500 incidents have been reported in the United States in connection with the Flushmate II 501-B pressure-assisted flushing system. At least 23 people have been hurt, one of whom needed foot surgery, and the incidents caused about $710,000 in damage, according to a recall notice posted Thursday by the Consumer Product Safety Commission. When pressure causes the system to burst at or near a weld seam, it can lift the lid of the toilet tank or shatter it completely, the agency said. Another version of the Flushmate product, the Series 503 Flushmate III, was subject to three recalls since 2012. The recall affects about 1.4 million units across the country along with nearly 17,500 in Canada. The units were sold widely for nearly two decades, including at Home Depot and Lowe's stores, and are identifiable by looking on the label for series number 501-B, a model number beginning in M and ending in F and a serial number that begins with date codes between 090396 and 120713, indicating the dates between Sept. 3, 1996, and Dec. 7, 2013. Anyone with a recalled unit is advised to turn off its water and flush the toilet to release the pressure inside. Flushmate will replace and install the recalled units for free. Contact the company at 844-621-7538 between 8 a.m. and 10 p.m. ET on weekdays or between 8 a.m. and 6:30 p.m. ET Saturday, or visit this page.